Tom Langdon, Development Consultant stands in front of the construction work being done on the John H. Johnson Care Suites, due to be finished in the fall of 2018. There is an exciting new concept in affordable Senior living being lovingly constructed right here in Oklahoma City, John H. Johnson Care Suites, is a place for active living with exceptional healthcare for Seniors. 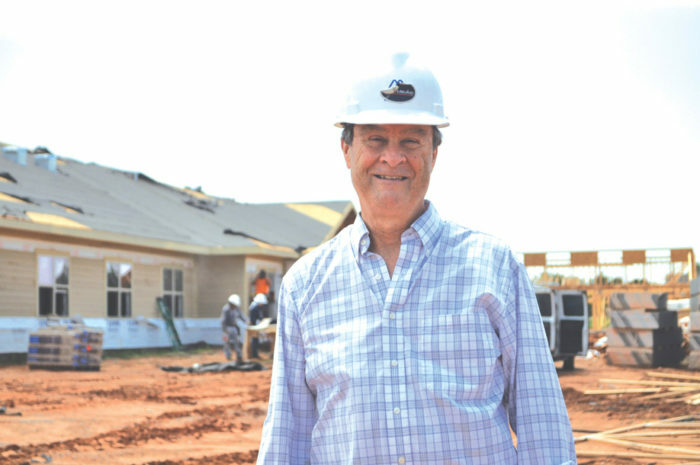 Meet Tom Langdon, Development Consultant and partner with John H. Johnson Care Suites, which is being developed by Community Enhancement Corporation, a subsidiary of the Oklahoma City Housing Authority. Together, they are making this project happen. Each resident will have a beautiful secure apartment in a community where 3 meals a day are served, housekeeping and necessary laundry is done and help with daily activities are all provided. Those who live here will see an improvement in nutrition and their social life. An attached medical clinic assures that each resident have proper primary medical care. An activity room is also available, including art work and sculptures for the residents. Local artists will visit often to interact with the residents. Each apartment will be spacious with beautiful decor, complete with a large picture window to cast plenty of light in the living room. Granite countertops set off the kitchen, along with detailed cabinets with shelves above giving plenty of cabinet space. Residents will be proud to call John H. Johnson Care Suites home. The wellness of each resident is the primary concern of the caring staff. Everyone is encouraged to be active in spiritual development and artistic expression as well as social interaction. There will be 120 apartments designed for assisted living. There will be 10 separate duplexes (The Cottages) that will have 2 bedrooms, 1 bath for independent living, available for those that qualify. The price will be on a sliding scale based on their income. A resident will need to qualify in two ways, they will need to qualify medically that they need assistance and qualify financially making less than $2,000 a month. Any elderly American citizen is entitled to $750.00 a month through social security and SSI. The Care Suites will be unique in its own way. There is not another place like it in Oklahoma City. One of the unique qualities about this community living will is the Prairie Gardens Gallery. The many walls in the public area of this community will be totally different than the other assisted living facilities. There will be original art work from local artists on display and we will be selling them to you. The appearance of Prairie Gardens Gallery will be full of uplifting and the perusal of art collectors through the exhibit wings will enhance the liveliness of our community. Net proceeds of the Gallery will benefit the resident benevolence account. “We are looking at having The Care Suites finished by fall of 2018 and so far, we are on schedule,” said Langdon. “The whole point of this project is to help seniors in need. My favorite part of this job is when I see the faces of the elderly after they move in and live here,” Langdon added. Another plus for the Care Suites will be the 15 acre property that will be filled with trees, shrubbery and flowers. It will be a great place for taking walks, enjoying the scenery or chatting with friends. Gardens are to be planted outside the buildings in front of windows so residents of the Gallery can sit and view them. These areas will have doors that will allow residents to walk the garden paths that will be paved with porous material. All other areas will be lawns of native grasses. “I am excited to share this news with you and I can’t wait for this project to be finished with residents living here. If we improve the health, nutrition and housing of the elderly regardless of their income, I would say we have accomplished our purpose,” commented Langdon.